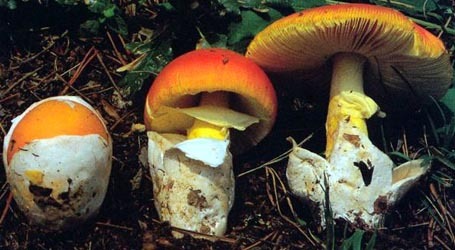 english name "African Sister Ringless Amanita"
1. 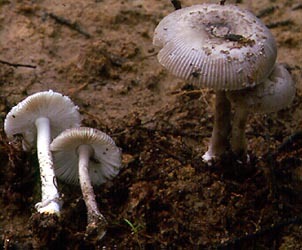 Amanita calopus, Copperbelt Prov., Zambia. intro This description is based on that of Beeli (1935) with additions from notes of recent collectors, etc. cap The cap is 25 - 60 mm wide, convex to plano-concave, and rather thin. The context of the cap is firm and white. The cap margin is long-striate. The remains of the volva on the cap are friable and may be in pyramidal warts or disordered. gills The gills are free, attenuate at both ends, white, and 5 mm broad. The gills are not described. Beeli provided no information on the short gills. stem The stem is 100- - 110 × 3 - 9 mm, cylindric or narrowing slightly upward, and has a small bulb at the base. It is stuffed, and its flesh is white. Its surface is fibrous to pulverulent, white at the apex and becomes darker downward through pale smokey gray to smokey gray at the base. It is easily detached from the cap. There is no annulus, and the friable volva (white or light gray with a pale orangish tint where not long exposed to air and sunlight) is distributed in one or more complete or broken rings at the base of the stem, above the small cuplike part of the volva that may appear to be a basal bulb. These volval remnants in rings are, finally, the same color as those on the cap. odor/taste The taste is bitter. The odor is not recorded. spores The spores of a small amount of recent material from Zambia measure 7.8 - 13.6 (-15.1) × (5.5-) 6.0 - 8.8 (-9.0) µm and are ellipsoid to elongate and inamyloid. Clamps are absent from bases of basidia. discussion Beeli reported this species as occurring under Gilbertiodendron (=Macrolobium) dewevrei. It was described from the Democratic Republic of Congo and is known from central Africa. For comparison to somewhat similar species from other regions, see A. ceciliae (Berk. & Broome) Bas, A. sororcula Tulloss, Ovrebo & Halling, and A. rhacopus nom. prov.. Note however the ellipsoid to elongate spores of the African species easily separate it from other Ringless Amanitas with friable, graying volvas. Evidence is growing that taxonomists have not resolved the meaning of A. calopus in the strictest sense. Tang et al. 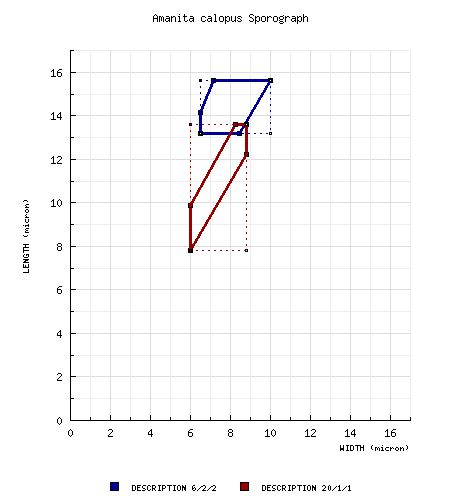 have recently published a proposed description and DNA sequence. Their macroscopic description does not match that of the species depicted on this page. The DNA from the collection RET examined does not match that from the Shah-Smith collection examined by Tang et al. Tang's spore data is very similar to RET's. However, limited available spore data from the original collection of A. calopus differs from both Tang's and ours. Moreover, Tang et al. report that the description of Pegler and Shah-Smith is based on collections of more than one species. author (Beeli) E.-J. Gilbert. 1941. Iconogr. Mycol. (Milan) 27, suppl. (2): 228, tab. 9. ≡Amanitopsis calopus Beeli. 1931. Bull. Soc. Roy. Bot. Belgique 63: 108, tab. 9 (fig. 14). selected illustrations Beeli. 1935. Fl. Champ. Congo 1: pl. 4 (fig. 5). The following material is derived from the protolog of the present species, (Beeli 1935), (Gilbert 1940 & 1941), and original research of R. E. Tulloss. pileus from protolog: 50 - 60 mm wide, fuligineous-gray, plano-convex to concave; context white, firm; margin striate; universal veil as dark pyramidal warts. lamellae from protolog: free, density not recorded, white, ca. 5 mm broad; lamellulae not described. Beeli (1935): additionally—inamyloid; white in deposit. RET: [20/1/1] 7.8 - 13.6 (-15.1) × (5.5-) 6.0 - 8.8 (-9.0) µm, (L = 11.7 µm; W = 7.7 µm; Q = (1.30-) 1.39 - 1.65 (-1.78); Q = 1.53), hyaline, colorless, smooth, thin-walled, inamyloid, ellipsoid to elongate, ?? ; apiculus sublateral, ?? ; contents ?? ; color in deposit not recorded. ecology from protolog: Democratic Republic of Congo: Scattered. Terrestrial in dry forest of Gilbertiodendron (=Macrolobium) dewevrei (De Wildem.) Léon. material examined from protolog: CONGO, DEMOCRATIC REPUBLIC OF: PROV. EQUATEUR—Territoire Lisala - Binga [2°23'41" N/ 20°25'25" E, 361 m], iv-v.1927-1928 M. Goossens 611 (lectotype; BR), M. Goosens 695 (syntype, BR). Beeli (1935): CONGO, DEMOCRATIC REPUBLIC OF: PROV. EQUATEUR—Territoire Lisala - Binga [2°23'41" N/ 20°25'25" E, 361 m], iv-v.1927-1928 M. Goossens 611 (lectotype; BR), M. Goosens 695 (syntype, BR). Gilbert (1940 & 1941): CONGO, DEMOCRATIC REPUBLIC OF: PROV. EQUATEUR—Territoire Lisala - Binga [2°23'41" N/ 20°25'25" E, 361 m], iv-v.1927-1928 M. Goossens 611 (lectotype; BR), M. Goosens 695 (syntype, BR). RET: ZAMBIA: COPPERBELT PROV.—off Kitwe-Ndola Rd., Greystone Farm, 14-24.xii.2000 David Arora 00-370 (RET 345-8, nrITS & nrLSU seq'd. ; SFSU). discussion Evidence is growing that we have not resolved the meaning of A. calopus in the strictest sense. Tang et al. (2015) have recently put forward a description for A. calopus with an associated nrLSU sequence. Their macroscopic description does not match that of the species depicted on this page or that of the type. The nrLSU from the collection we have described does not match (genetic distance of 6%) that from the Shah-Smith collection examined by Tang et al. Tang's spore data is very similar to ours. However, limited available spore data from the original collection of A. calopus differs from both Tang's and ours. Moreover, Tang et al. report that the description of Pegler and Shah-Smith is based on collections of more than one species. Their data derives from the collection of Shah-Smith that they judge is most like A. calopus. In eastern North America, we are finding a large number of taxa with graying, friable universal veil in section Vaginatae (e.g., A. rhacopus, A. texasorora, etc.). For some time, North American mycologists simply misapplied one name (A. ceciliae) to all the probably distinct taxa. In another large and heavily forested continent, why should we expect a simplicity that we do not find elsewhere? Why should we expect that, within Amanita the limited descriptions of early workers will present no problem to intepretation? The evidence for a contrary view is mounting. select a collection to review/add spore measurements..#768806. David Arora, #00-370, ZAMBIA, COPPERBELT PROV., off Kitwe-Ndola Road, G..#768813. David Arora, #00-370, ZAMBIA, COPPERBELT PROV., off Kitwe-Ndola Road, G..#783456. M. Goossens, #611, CONGO, DEMOCRATIC REPUBLIC OF, PROV. EQUATEUR, Terri..#783457. M. Goosens, #695, CONGO, DEMOCRATIC REPUBLIC OF, PROV. EQUATEUR, Territ..#783458. M. Goossens, #611, CONGO, DEMOCRATIC REPUBLIC OF, PROV. EQUATEUR, Terri..#783459. M. Goosens, #695, CONGO, DEMOCRATIC REPUBLIC OF, PROV. EQUATEUR, Territ..#783460. M. Goossens, #611, CONGO, DEMOCRATIC REPUBLIC OF, PROV. EQUATEUR, Terri..#783461. M. Goosens, #695, CONGO, DEMOCRATIC REPUBLIC OF, PROV. EQUATEUR, Territ..#810350. M. Goossens, #611, CONGO, DEMOCRATIC REPUBLIC OF, PROV. EQUATEUR, Terri..#810351. M. Goosens, #695, CONGO, DEMOCRATIC REPUBLIC OF, PROV. EQUATEUR, Territ..#810352. M. Goossens, #611, CONGO, DEMOCRATIC REPUBLIC OF, PROV. EQUATEUR, Terri..#810353. M. Goosens, #695, CONGO, DEMOCRATIC REPUBLIC OF, PROV. EQUATEUR, Territ..#810354. M. Goossens, #611, CONGO, DEMOCRATIC REPUBLIC OF, PROV. EQUATEUR, Terri..#810355. M. Goosens, #695, CONGO, DEMOCRATIC REPUBLIC OF, PROV. EQUATEUR, Territ..#810356. David Arora 00-370 , #s.n., ZAMBIA, COPPERBELT PROV., off Kitwe-Ndola..